Right at this moment, a bunch of music fans are sitting in rows at the San Francisco Museum of Modern Art's Wattis Theater, eagerly awaiting the fate of Pandora, the cult-hit semi-customizable Internet radio service. What are they about to hear? That Pandora is teaming up with Sprint and Sonos to get into mobile and household gadgets, and is also introducing a new online interface for the free service. Why should you care? Mobile Net radio has been in the non-existent to sucky range, and a lot of people enjoy Pandora in Web form. At least until Slacker's many promises are realized, this is the biggest step in mobilizing Net radio to date. Slacker Satellite/MP3 Players: Revolutionary or Just Complicated? • Starting now, five Sprint phones will be Pandora ready, and by the end of June, Pandora says that all Power Vision phones will be good to go. If you have a Pandora.com account, you will get "seamless integration" into your phone. Besides, you will be able to create and fine-tune stations using just the phone. After a 30-day free trial, the ad-free Sprint Pandora service will cost $2.99 per month. Keep in mind, there'd be a Sprint data-service requirement of at least $15 per month on top of that, and there's no word of how good the streaming quality is, but if you already pay for Power Vision, it's probably worth a try. 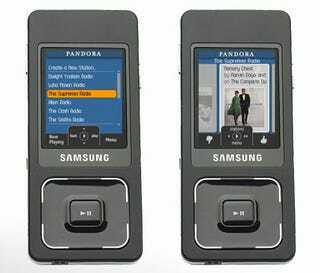 Below are shots of Pandora on the defunct Samsung A900; our opening shot is of the Pandora interface on the new music phone, the UpStage. • The final point of Pandora's presentation involves future applications. Wi-Fi-connected players are an obvious point. No, there is no Zune creeping into the picture (yet), but there might be a different Connect-ion: the presentation says that Pandora is showing off a Zing-enabled device. Well, the Sansa Connect is the only one of those we can think of off-hand so, like, sweet!